If you seek to add challenge to your workout, the plethora of options on the market can get confusing. You'll find all sorts of devices you can sit on, stand on, push and pull to help shape and tone your body. 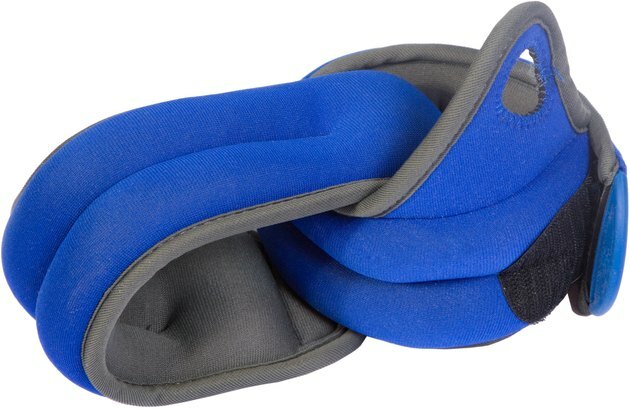 However, just a simple pair of ankle weights can deliver the benefits you want. Once you know how to use them, you can incorporate ankle weights into numerous exercises in your routine. On their own, leg raises can improve your flexibility and range of motion. For optimal toning, however, you must add resistance. This does not mean using heavy weights or bulking up. It just means adding weights to your workout to fatigue the muscles. The American College of Sports Medicine says that many people, especially women, focus on doing many repetitions and avoid using weights. However, to grow stronger you must work muscles until they tire. When done properly, adding ankle weights to your leg and glute workout will give you the shape you desire without making you look like a body builder. An added benefit: Muscle burns more calories than fat, even at rest. Stronger leg muscles will boost your metabolism and help your weight-manegement goals. To get the most benefit from your workouts, change things up once in a while. Doing the same exercises the same way all the time will cause your body to adapt to the movements, and the benefits will taper off. If you tend to just use machines or cables to work your legs, try ankle weights to do the same exercises in different positions. You can do leg exercises while standing, seated, lying on your back or stomach, or kneeling on your hands and knees. One caution: Avoid walking with ankle weights. It is not beneficial, and it can be harmful, according to the University of Kentucky. Wearing ankle weights while walking places too much stress on the ankle, knee and hip joints, and it can throw off your alignment, both of which can lead to joint pain and damage. If your abdominal routine has gotten too easy, add ankle weights, which are especially beneficial for targeting the lower abdominal section -- a hard area to train. Instead of doing situps, wear ankle weights and perform bicycle exercises, reverse abdominal lifts and knee-to-chest exercises. When you use ankle weights this way, keep your abdominal muscles contracted and maintain a pelvic tilt throughout each exercise. Always do the movements slowly and with control, and avoid swinging yourself through the motion. Moving too quickly while wearing weights may cause back injuries. Ankle weights can help ease asthma or other breathing problems when you rest them on your chest. Breathing with ankle weights on your chest is like strength training for your respiratory muscles, and can help make them stronger and more efficient. You can use the weights while practicing any breathing exercises your doctor or therapist recommended. Before attempting this, consult your healthcare provider to make sure weighted breathing is appropriate for you.